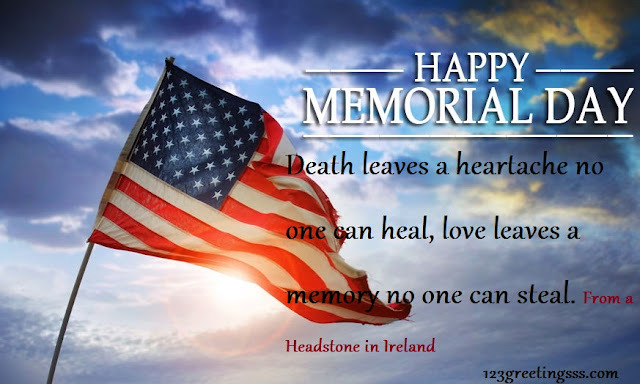 On this special day of observing our men and women who serve and have served our country, I just wanted to take a moment to think about the fact that we should not only remember them, but think about how they set examples for us and inspired us with their courage. I salute each and every one of then and for today's blog there are quotes from many different people that I would like to share. As I read them, each one of them gave me a moment to think upon what the true meaning of patriotism, heroism, and sacrifices really means to me. I hope that you will take a moment to let the words wash over you. Some required some deep thoughts from within me. "Patriotism is supporting your country all of the time, and your government when it deserves it." "There is nothing wrong with America that cannot be cured by what is right with America." "The legacy of heroes is the memory of a great name and the inheritance of a great example." No matter what you have chosen in your life, you need to always display a confidence in your decisions. This is not just about your career. It includes the choices that you make all day long. It may be what you chose to wear, the way you styled your hair, what you made for dinner, how you led a meeting...the list goes on and on. A very famous tennis player, Arthur Ashe, has a quote that happens to be one of my many favorites: "Regardless of how you feel inside, always try to look like a winner. Even if you are behind, a sustained look of control and confidence can give you a mental edge that results in victory." It is believing in yourself. Confidence is not walking into a room with your nose in the air and thinking that you are better than anyone else in the room. It is walking in the room and not having to compare yourself to anyone else in the first place. My interpretation of this is if you dress the part, act the part -- you might just get the part. It convinces others that we are capable of doing what we say we can do. The trick here is convincing ourselves of our competence. Talk the talk and walk the walk with the right attitude; we can be as confident as we look and sound. Eleanor Roosevelt had the right idea when she said, "You wouldn't worry so much about what others think of you if you realized how seldom they do." Have you ever been told that someone loves your outfit, only to hear the next statement is that they wished they could carry that look off. 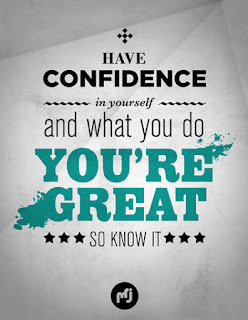 If you have no confidence in how you perceive yourself then your confidence is thrown right out the window. What you think of yourself is much more important than what other people think of you. We all must believe in ourselves so that we can become the person that we desire to become. 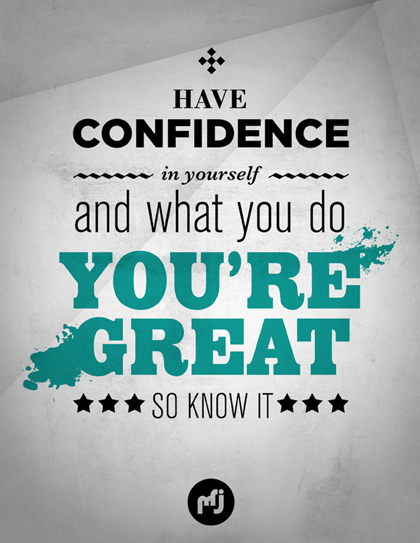 One thing that I have come to learn is that self-confidence can be developed. It is a matter of having a talk with yourself daily. Perhaps even a mentor (friend or loved one) can help with showing you how to see the possibilities within your own self. For me, I have been surrounded most of the time with ones who helped me "go for it." How many of you remember the USA Olympic Gold Medal Gymnast, Bart Conner? He won the gold medal against all odds. He now is a successful motivational speaker. He tells the story that every night when he went to bed his father said to him that he was a success. Bart said when he woke up each day, that he started his day knowing that he was a success. This is one way that confidence is built. A positive way to help yourself develop a higher level of confidence (at least it has helped me in all of my endeavors) is the think of how Vincent Van Gogh looked at life. He said, "If you hear a voice within you say you cannot paint then by all means paint." Sometimes I have really no idea of what my blog will be on for my publishing day. I do keep a list of ideas that I can go to, it is just that sometimes something else catches my attention. In the news today, I happened to come across an article about David Letterman. When he was on TV, I admired (even if I always did not agree with his manners) his quick wit and humorous ways with his guests and the audience. Since his retirement, I saw a picture of him that was posted everywhere showing him with an out of control mountain man beard looking as if he had aged 20 years in such a short span of time. WOW! At that time, I don't remember reading much about it. Just the picture! It even crossed my mind that it was a joke. David Letterman said that when he finally was not on TV his goal would be no more shaving every day. He claimed that he had to get up and shave for 33 years. Mr. Letterman also added that he has been enjoying his "creepy look." (His words - not mine) Having some knowledge of behavioral disorders, there was another disorder that came to my mind and that was Attention Seeking. If I can't get attention in a positive manner, than I will get it in a negative manner, as long as I receive attention. Even when I heard him speak briefly at the function, he did not sound like the David Letterman I remember hearing just a year ago. He sounded like a 90 year old man. Almost, as if he had given up on life itself. If you were the star of your own TV show for the number of years that he was, just imagine the hardship of going from a STAR to nothingness (and this nothingness is most definitely in his own mind). The ego must be playing a major role in his emotional being. You see, I have found out, and luckily knew in advance, of my own retirement that being ready financially is only one small part of the whole picture. You must be ready emotionally and socially. Think of how many people that you know who go from being the star of it all and then retiring and just withering into nothingness. I know that I have seen it. They had made no plans for what would be next. Definitely, I am not an expert on retirement. It is quite new to me, as I retired just 5 months ago. 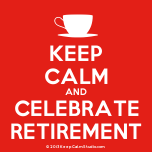 All I can say is that before you retire have a plan in place that does not just include finances. That is important. It is very important to be ready for taking charge of building your own structure to your new life. I loved what I did most of the time, however, now that I have a more creative daily structure, I now know this is what I was most definitely cut out to do. There is a book titled How to Retire Happy, Wild, and Free by Ernie Zelinski. This book offers inspirational advice on how to enjoy life to its fullest by taking charge of your mental, physical and spiritual health. I highly recommend this book to anyone thinking of retiring. One of David Letterman's skits included the Top Ten Lists. In the book that I recommended, Mr. Zelinski has a list of 25 Reasons to Retire Early. 10. You get to set your own agenda. 9. You have no daily rush hour traffic to contend. 8. You have plenty of time to eat out with friends. 7. By doing things when everyone else is at work, you can be much more efficient and less hurried at the same time. 6. You can take a nap when the urge hits. 5. You don't have to work through your lunchtime. 4. You have fewer headaches because life is simpler. 2. It is easier to be spontaneous. 1. More than any other time in your life, you have the opportunity to put all areas of your life in proper balance. There is something uplifting about following your own dreams instead of someone else's. Think about how many times you have heard the expression, "Don't judge a book by its cover." This was used in conversation between my husband and I several times this past weekend. As a writer, when I see and hear things, anything is fair game for me to write about. I knew that this would be my blog for Monday. As usual, I like to do a bit of my writing outline and then research, sometimes just to see if anything else interesting is out there in cyber space concerning my topic. And so it was....at least to me. Did you know that Bo Diddley recorded a song called, "You Can't Judge a Book By The Cover?" Well, I can tell you this much... my musical trivia husband probably did. And if you did too... good for you. I did not. However, I looked it up to hear it and see the words. He sings that: You can't judge an apple by looking at the tree, You can't judge the honey by looking at the bee, You can't judge a daughter by looking at the mother and You can't judge a book by looking at the cover. If you need to hear more, you can Google it and play it. That was pretty much enough for me to get the idea. Although, when I looked up the release date, I found out that it was 1962 and that reminded me of the musical that Steve and I saw this past weekend, Memphis. It was at a local Community Playhouse, and I must say that it was a marvelous production. We had the Broadway production to compare it to. The directing, actoring, singing and dancing right here in Memphis were comparable to the Broadway production. Several of the actors did a fine job acting and dancing, however, based on what I perceived, I did not hold out high hopes of their singing voices compared to the others that I had heard at this point. To my discredit for making a judgmental call, they blew me away. One could hardly believe that they could hit those notes that they hit. WOW! This takes me back to giving myself a talking to about judging others when I do not have facts. It is not fair to judge based on looking at someone. In searching for this in the dictionary, I was able to find that this English idiom is a metaphorical phrase which simply means you shouldn't prejudge the worth or value of something by its outward appearance alone. That sums up totally what I believe in, yet there I was doing exactly that. Shame on me! I hope that this mistake will stick with me so that I do not continue to make snap judgment calls. Usually, that is so not me. Obviously, I have a way to go. Down deep, I am fairly certain that we all have this to work on to some degree or another. Then on the very same day on Facebook, a person wrote on my husband's page that all along she had considered that he was "just a boring 'dude.'" He had been challenged to put up a 70's song, one a day, for seven days that meant something to him and tell why. He was at this point on his sixth day and song and she had never ever before written on his page, however, she now wrote that he was "so freaking cool and all this time she just thought he was a boring dude." What was she doing? She was looking at a book and judging by its cover. For those who know him, the words boring, dull, quiet, are words that are 180 degrees from who he is. Of course, in a large work place, it is usually a quick hello/goodbye to most people you pass, except for immediate pod-mates or those working on a project together. It would be beneficial if we all could be less judgmental of one another because we do not walk in the other person's shoes and there could be some interesting adventures that could be shared. If we all can remember this reference from Bob Marley, it may help us to not judge a book by its cover: "Who are you to judge the life I live? I know I'm not perfect - and I don't live to be - but before you start pointing fingers...make sure your hands are clean!" You never know what you may find out without making judgmental calls simply by looking at "the book" without reading some first. So I started this blog and ended on musical references as Bo is singing on my IPhone right now. Next up? A little reggae! Once a person has been married for 20 years or so, recovers and starts a new life and then somehow finds themselves in the world of dating all over again, it can be terrifying. I will never forget one of my very first dates that went very wrong. He seemed to be a gentleman, a great conversationalist and he asked me out to a local university basketball game. At the time, I was living in a home that I had purchased with my Mom and my daughter had moved in, as she had just graduated from college. Three females, three generations, all dating is an equation for adventure. Men had to be bold, confident and strong to walk into a situation such as ours. My daughter and I were walking up to the house and slowly the pieces to the puzzle were coming together.My daughter and Mother were in the family room watching TV when a mouse kept running across the from the sofa through the front of the unlit gas fireplace to the TV. My mother was on top of the kitchen island overlooking the family room, making no sense at all with what she was babbling on and on about the mouse when I walked in. Let me also go back to tell you that we bought this newly built home in a cove so there were only 3 other homes so far that had been built.The rest of the cove was open fields. So as the temperatures dropped, little critters were trying to find warm places to live. This one just so happened to find our home. Normally, I would be up on top of the island with my Mother and daughter now, but something told me someone had to do something, even though this was not my usual character when a mouse was involved. I had suspected a mouse in the house so the weekend before I had gone to Lowe's and purchased glue traps for mice. Never ever would I have been able to set a real trap. And, just to be on the safe side, I bought 25 traps. In fact, I bought everyone they had in stock. The clerk stood with his mouth opened and finally asked if I had a big mouse problem. I told him that I was just making sure that I never had a big mouse problem. So, my creative mind went into action. I asked where they thought the mouse was right now. Both agreed that he was under the sofa. OK then.... I walked out to the garage and grabbed the bag from Lowes with all of the glue traps inside. I opened each one. I placed glue traps all around the sofa. The back was against the wall so I only had to go along both sides and the front of the sofa. I did this while sitting on my knees on the sofa. I grabbed one of the fireplace tools and started to bang on the sofa from one end to the other and of course yelling at the mouse to come out and play. "Come out. come out, wherever you are!" I tried to find some humor, however the two standing on the kitchen island were not buying into humor. In fact, my Mother picked up the kitchen wall phone and with shaky hands, she was trying to get numbers dialed. I asked her what she was doing and she proceeded to tell me that she was calling 911. OMG! Now we were going to be arrested and fined for calling 911 for non-emergency calling. I managed to get my daughter to get the phone from her hand, which was not an easy task. I also had her unplug the headset from the phone so there could be no connecting to an outside line. Back to banging on the sofa and abracadabra it worked. That little mouse came charging out and got stuck on one of the traps. The two on the kitchen island were clapping and so happy, as if it were all over. I stopped them and said now what are we going to do. And I emphasized, "WE." The mouse was positively squeaking very loudly at this stage. To this day, I can hear that sound. It was horrible. Truly, I am not a bad person, it is just that I wanted this uninvited guest out of our home. Now that he was on the sticky glue trap, I knew that he was a goner. Again my creative mind had to go to work in order to handle this problem. I told my daughter to go out to the garage and to bring in the longest handled shovel that she could find and a large trash and leaf bag. She did so quickly and tried to hand them off to me. Quickly, I told her that I could not hold the bag open and get the mouse scooped up and tossed in the bag. She was going to have to do one or the other and she could have her pick. She chose to hold the bag open because she could put it way out in front of her and close her eyes. She figured that if she had to scoop up the trap with the mouse on it that her eyes would have to remain open. Somehow we did it. I am not quite sure how. She gave me the bag and I tied it up tight with the plastic handles on it and walked outside to the trash bin on the side of the house. I had to take a moment to breathe in and out. By the time that I returned inside, my Mother had come down from the kitchen island and had a bottle of wine that she was opening to celebrate the night that "WE" killed a mouse in our house. Really, I do not harm animals. Normally! This was not a normal situation. And I am not proud of the fact that I had to do it this time. I am not an activist for even hunting. 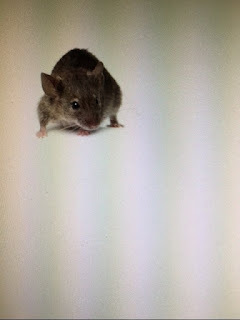 There were a few more incidents of a mouse coming in and the mouse tales, such as this one will be in my first novel that I am working on about the life of three adult single females, three generations; all living under one roof and surviving. And oh yes, what really took place at our home involved much more than just mouse tales. I just can hardly wait to finish it and have it published. The other day while researching and reading articles about life in general, I came across an interesting take on stress. It actually put stress in the category of a way for it to help you remain calm and kick it up a notch to help you do better. Now I am definitely no expert on the subject of stress. I have my share just as everyone else does. I know what does help me when I am feeling stressful as well as what does not. So let me start with what does (and it actually was listed in some of the research that I was reading over). That is breathing! Breathing helps me put myself back in control. Have you ever tried that? Deep breaths in, hold it and then deep breath slowly letting it go. Sort of like you do in a yoga class, if you have ever taken yoga. What I did not know is why it works well and the reason is because it lets your nervous system know that it can "chill out." There apparently is a lot of research in this area if you are interested in delving deeper. In a previous blog, I did talk of mindful meditation, which seems to be a key phrase tossed around these days. For me, it goes right along with the breathing exercises. It helps you to train your brain on the present....breathing, instead of trying to force yourself to calm down. Just simply sitting down silently with your own thoughts. Everyone has different feelings about this process. Some find it intimidating to sit quietly with their own thoughts so it takes a bit of creativity to help them find a way to channel their stress through breathing and mindfulness. One way that a person gave as an example that worked for her was before she walked into a potentially stressful meeting, she gave herself six seconds of mindful breathing before walking in to the meeting. Whatever works for you! Another tried and true method is to talk to yourself. It has been proven to actually work in studies. Stand before a mirror and talk to yourself as if you were someone else. Use your name, not I, and tell the person in the mirror all of the good characteristics he/she possesses. Stress positive and strong traits and be firm. This is especially helpful before an interview or presentation. If you are thinking more about the positive effects of stress, it can improve your responses to challenging situations and help you learn and grow from the experiences. The one study that I had trouble "buying in to" was to drink more coffee. This study was only performed on mice and not on humans as of yet. Well, I know my opinion of mice. And it is not positive. It seems that the mice who were given only water acted more helpless in performing memory tests, while those given caffeinated water did not exhibit any of those behaviors. This just seems a little bizarre to me, knowing that if I get too much caffeine, the jitters can set in and I don't perform well at all. Not sure about you, but I am thinking that I would need to see more data with this claim. We all are in this world together and we know there is a lot of stress in everyone's lives. We just need to find ways to help each other channel it in more positive ways. If you read or watch the news, I believe that we all would agree that letting stress rule us and take over in negative ways is simply not the answer. Have you ever been at an event such as a ball game, a concert, a play or some other event that gives you tickets with assigned rows/seats? Let's say a family or friend group of 6 or so people come in to the arena or stadium or theater each holding their ticket. They are led to the right row and then the fun begins. They each have a seat number on their ticket. Now mind you, they are all together but glory be......they all seem to be dead set to only sit in the seat that is on their ticket stub, as if the seat police will come and haul them away if they dare be a rebel and sit in another seat. As an observer, I can sit back and become amused at this human behavior as long as the show or game has not already started yet. However, when the event has started, I just want to yell out, "Please take a seat!" Honestly, it does not matter if your group of 6 is holding 6 tickets from 20 - 26, then just sit in one of those seats. It is not rocket science. On Sunday afternoon at a Symphony concert, my husband and I become very amused watching the comedy taking place concerning seats. I suppose that was just a little bonus thrown in before the real show started. Actually, I have even witnessed this happen with two people. Two friends (I am guessing, because they arrived together and walked in together laughing and chatting). They arrive at the seats on the tickets in their hands and then discuss having to switch over so that they are in the seat listed on their specific ticket. Really? Now let's visit once the event has ended. In a row of seats, you must file out in single file order for the most part due to the space. But wait! Some sweet little lady stops to talk to another sweet little lady friend that she has not seen for a while that was sitting three or so spots down from her and now no one is going anywhere as she starts asking about this lady's grandchildren and husband or the recipe that she tried that night for dinner. 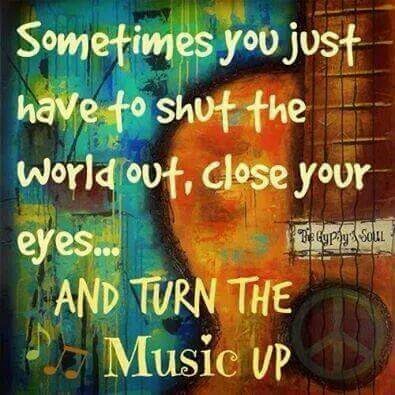 This is when I am ready to start singing, "Ease on down the road!" Or if they came to a dead stop in front of the exit door to put on their jacket. Hundreds of people are behind them. Could they use a little common sense to move it on over? Voltaire most definitely had it right way back in 1764 when he said, "Common sense is not so common." So the best way in my book to deal with most of life's absurdities is to be attracted to it and enthusiastically engage with positive possibilities in order to let all that could agitate you go out the window. Some of that came from my horoscope words for the day. Just people watch without judging...........it is free comedy relief. There are times that even the very top of the ladder optimists must remind themselves to continue to accentuate the positive and eliminate the negative. The reason that I am writing this (actually, the reason that I write most of my blogs is a part of myself that I need to let go). Writing does this for me. When I was in school and had to at least pretend to be listening, writing was not really an option, however doodling was.......... and I was a great doodler. Still am and it is a great way to stay focused on what is being said. Back to my train of thought; where I am going with this blog is to help me and hopefully some one else to rethink allowing negativity to seep into your mind. What good will come of it? If you need a moment to vent then do so. Time yourself if necessary. Sometimes for me it is a necessity. Then think to yourself and ask, "What good comes out of whining and complaining?" Absolutely NOTHING! You can say the squeaky wheel gets the oil, yet squeaking along in a more positive manner with suggested outcomes and solutions will go a lot further than behaving as a spoiled two year old. Sharing a method that I use may reveal what kind of nerdy person that I am - hey - all I can say is it works for me. Everyone needs to find their own way and here is mine. First, I must digest the information given to me just so it can rumble and tumble in my brain like clothes drying in a tumble dryer. Next is having a very special someone that you can talk out your thoughts. Sometimes, I even have a positive list and a negative list and try to find many more positives than negatives about whatever is going on in my life. Many times, this requires you to dig deeper to help you cope with a challenging situation....all I can say is that it is always worth it. Get real with yourself. Think about what really matters is the outcome of the positive strategies that you have put in to place. This may sound hokey. Trust me. It works. There are truly people who state that they just could not live if they had to skip a day of exercising. Really? I can tell you that I believe that there are more in the majority of the human race who could live just fine if they did skip a day. 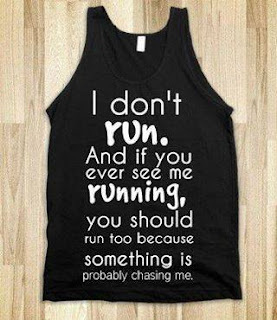 Intellectually, I realize how beneficial exercising is to our health. Now that I am of a certain age, I also understand that weight is not going to drop off without doing some form of exercise, whether it be yoga, zumba, walking, water jogging or using the recumbent bike. And I must also add that once I get on a routine, it does feel good. In the same breath, I can also say that yes, I would be able to live if I were forced to skip a day here and there. So this is where I am in the crossroads of diet and exercise. I do love to cook and I do love food. I don't love to get all sweaty and exercise. So there has to be a balance if I want to eat good foods and not be the size of the side of a barn. My goal is to be walking again on the treadmill for 30 minutes five days a week and then use the zaaz machine. When the pool water is warm enough to get in and on the days that I can get in the pool, the goal is to water jog for 45 minutes. At some point during the day get on the zaaz, which is easier because the time limit to be on this machine is 12 minutes at a time. Now that I am working from home, it is a matter of being set in a routine. A routine for writing has been set and therefore, so can exercise. At one point, I was spending a fortune for a personal trainer. He somehow motivated me more because he was there pushing me onward and forward. He owned the gym and had ways of finding me to work harder for myself. After a couple of months, it seemed that he was starting to "farm" me out to his associates. Now, don't get me wrong. They were trainers also. They were not who I signed up with and they were not who I wanted to work with and they most definitely did NOT have the power to motivate me the way the owner did. When I questioned him about paying the same price whether it be for his expertise or one of the associates, he told me the opposite of what other private trainers told me. It was time to move on in my mind. This is why I know that I must get hold of my own motivation. Do it for ME. I do not need to pay someone money at this stage of my life to motivate me. We have plenty of equipment in this house and two intelligent people. A mantra that I have put up to see each and every day that helps motivate me is: EXERCISE BECAUSE YOU LOVE YOUR BODY, NOT BECAUSE YOU HATE IT! My first visit to the UK was to the city where my then fiance grew up, which was Coventry, England. He was born and grew up there with his brother, Dave and his Mum and Dad. We were invited to his niece's wedding and needed to hire a car and drive there for all of the wedding activities. Steve's Dad had not been doing well health wise and was not exactly thrilled about being put in a car and having to drive for a couple of hours to events where he would have to be pushed around in a wheel chair. This was, after all, his niece's wedding so probably that alone is what helped to motivate him to at least try. That, and the fact that he could stay with his son in their home while we were there. Steve's brother found us a lovely, quaint little Inn nearby. Steve did the driving and the car was a larger car in UK standards with four doors so his Dad sat in the back with his wife. Now please bear in mind that this was the first time that I had met anyone in Steve's family. I am sure they were questioning who this American woman was that he was bringing over to go to a very special wedding. They were full of questions, good questions, showing that they were interested in me and finding out about my life in the States. They made very sweet comments about how they thought that I looked like a movie star and how they loved my Southern accent. Then the big day for the trip came. There was a lot of conversation and as we talked I would read out loud the signs as we passed billboards and road signs while driving. These signs that would tell you how far away cities, towns and businesses were on down the road. I would say, "Oh look, we are not too far away from the Jaguar factory. Steve's Dad asked me to repeat what I had just said. He chuckled and asked me if I meant the Jag - you - are factory? I thought we were speaking different languages so I said no, I don't think so because I do not know what that is. I am talking about the car. At that point he was laughing out loud. Not at me, in particular............ at my American pronunciation.After all, this was the place they manufactured these cars. So we talked about that for a while until the next time we passed a sign and I said it looks like we are coming into Leicester. My pronunciation of this city is Li - ches - ter. Why? Because I grew up hearing it that way in a subdivision called Trafalgar Square and it was even spelled Leichester. Well, now he had tears rolling down his face because he was laughing so hard. As Steve and his Mum shared later, they had never heard him laugh like this for ages. So, I just did my own thing and pronounced cites and towns that popped up on signs whenever he asked me to. Worcestershire was a knee slapper because I put in the 4 syllables. Whereas, the British pronounce it as Wu - ster - sure. Almost ever shire is a sure. Staffordshire is not Staffordshire but Stafford - sure. As is Warwickshire - Warwick - sure. And then there are the names like Birmingham. Now I do not live that far away from Birmingham, Alabama. And if I said I am going down to Birming - uhm - no one would know what I was saying. Then there are the towns that have bury on the last syllable such as Banbury. Now that seems simple enough. I know the nursery rhyme of going to Banbury. Who knew that for 40 years I had been saying it all wrong. Anything with bury at the end is pronounced quickly with a berry and not slowly with a southern Banbury accent. This wonderful man, my fiance's Dad, never even knew that he was in the car for several hours because he was laughing the whole way. And of course, once we arrived where we were to be, he had the fun of telling of the drive. Not once was I offended or made to feel that I was being made fun of. It was simply the fact that we supposedly speak the same language, we just have many totally different pronunciations. Apparently that trip over the pond caused a lot of pronunciation changes for the Pilgrims over the years, as well as other changes. The one thing that my dear sweet husband keeps letting me know, is that I helped his Dad in so many ways, while really not even knowing it. So there....... I am so very proud that my Southern accent helped someone out and gave him such fun. Road trips, as I have said in blogs before, can be full of so many new adventures and good times. 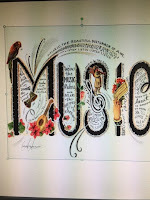 Today I really had not planned on writing about music again. Even though music plays such an important part in my life and our lives, as a couple. Our home has an excellent, quality sound system in every room, thanks to the Love of my life. So as I was pondering about what to blog today and my little imaginary friends in my head did not want to come out and talk, I posted the sign above on my FB page. I shared with my Love when we met for lunch and this is when he suggested to KISS. (keep it simple sweetheart) Go ahead and do a different perspective of one of the profound ways that music enters our lives. After all, how many teenagers go to a local TV station, get to meet George Klein to do a weekly high school commentary of fashion and end up playing keyboard with Booker T and the MGs? My high school nominated me to be the Teen Representative and so I was excited and delighted to go and represent our school. After I had my spot of time introducing the school models and what they were wearing, I was asked by a member of the band who was playing for this show if I knew how to play the keyboard.. I said that I played guitar and all I know about the keyboard is which end has the high notes and which end has the low notes. He asked if I could pretend to be playing along with the beat of a song. That I could do as long as the camerman did not focus on which specific notes that I was playing (or note playing, as the case may be). This was not live music. 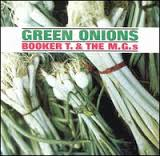 They asked if I knew Green Onions and if I thought if I could move and groove to that tune because their keyboard player had not made it to the studio yet. (who happened to be Booker T) They did announce that they had a stand in for the keyboard and did not make a big deal out of it. My heart was racing. Really, at the time, until my mother asked me what was I doing playing the keyboard for a band that she did not know. I just smiled and thought to myself that this was my 5 minutes of my claim to fame. WOW! It was only years later that I realized that I stood in for Booker T. What an honor! It just goes to show, you never know where your life journey is going to take you. 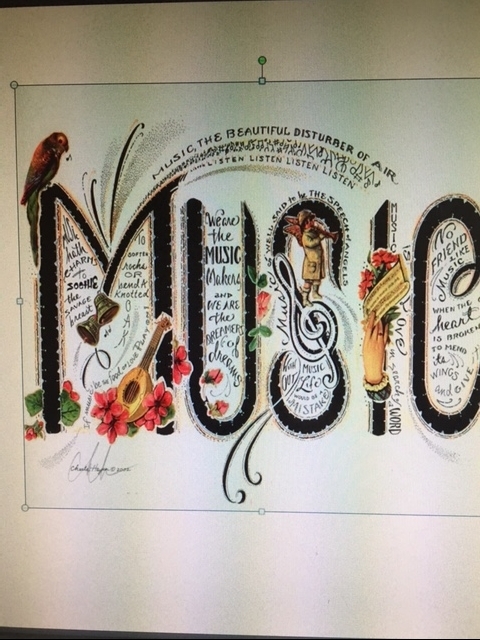 Music truly does make my heart sing in so many ways. I believe that we all have certain songs that can bring back specific memories.... some of them good and maybe some not so good. Your heart still sings though, whether it is a happy song or a sad song. I have a friend from Cornwall in the UK who has challenged me (because that is the way the game is played) to name 7 songs from the 70's that had a special meaning to me. I must put them on my FB page, one each day, preferably in YOUTUBE form so that all can enjoy a moment of listening. WOW! I was thinking this will be so easy. NOT! I believe that I have my list narrowed down to 65 or so. Roy is in the music business and actually knew some of the musicians who were and still are my idols. And, there are some songs that he has put up on his page that I have never heard of before. Some bands made it big in the UK and never came across the pond and vice versa. He asked me to join in because as he said, it would be interesting to get an American perspective. After all, my husband and I go through this all the time. He introduces me to bands that I have never heard of. Some, I know why I never heard of them and others, it was a shame that they did not make it over to the States. You see, my husband, before I knew him, was Smiley, the DJ - so he does know his music, including the labels, the years of the release, the artists and the names of the songs. Yet, and this is the unbelievable part, I still bet him on certain songs that I just know I am right and he is wrong. The score over the time that we met up until now has remained the same. His score - does it really matter? My score is ZERO! So now I am thinking of what songs would show music in America during the 70's. How could I not possibly send him "The Streak" from the 70's? The radio stations played it here all the time, day and night. And it is rather funny! And some of what I am choosing to put up I am not quite sure how big they made it over in Londontown...........We shall see!. I do know that Maggie May was big here when I was in college and Rod Stewart is British. Wondering about Three Dog Night? Frankie Vallie.............So I will continue to research until it is my turn to add on my FB page. Should be starting up around this coming weekend. If you are interested in looking my FB name is Donna Jo Dillard Miles. If you reach out for me to add you as a friend in order to hear them, please do. Happy Listening! So, let me challenge you, what are your seven favorite songs from the 70's? When I saw this poster with these words on it, I thought immediately of a play that we had seen just a few years ago called, "I Love You, You're Perfect, Now Change." It was a romantic comedy and had some very funny parts in the play. If anyone took the time to think about it just a little deeper, it really is how many of us overlook certain personality flaws because of love, love love. Then marriage comes along and each partner tries to change the other partner into what they really wanted them to be in the first place. This is so not right! Love is unconditional. That is why this poster hit me in such a funny way. 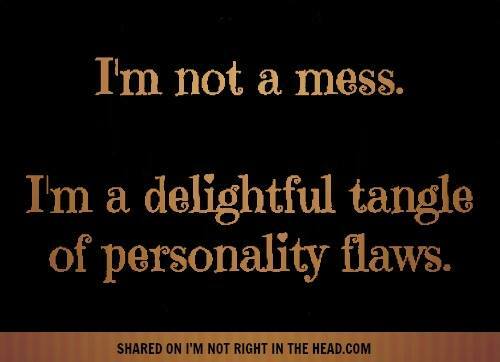 We all have our own personality flaws. Now let's get this straight........... I am not talking about major illegal flaws......... just your everyday, simple flaws that if you are living with someone, you need to just go ahead and accept them. The list could go on and on and really these are harmless behaviors, even if they may be irritating at times. What tends to happen is that the little things start to become big things and ADD up to major difficulties. You no longer have the idealized partner that you think you started out with - in fact, they have become less than ideal. 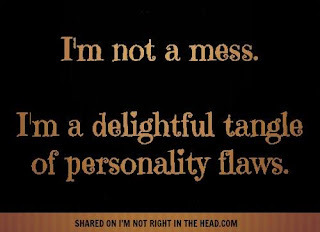 Let's go back to the poster above: We ALL have delightful tangles of personality flaws. How much of it can you overlook? Just go with the flow of life and ask yourself if it really matters. If it did not drive you crazy and take you over the edge when you were dating then why is it now so important? The way that I look at it is that there are basically three solutions to living with each other's personality flaws.The fist way is to drop it and overlook it. The second way is if there is good communication each partner pick A flaw that drives them crazy and promise that each will strive to improve.No need to try for miracles. Just ONE. The last way is the saddest way. Go your own ways. If you can honestly say that your life would be better off not having dirty dishes in the sink then to remain with your partner then it most definitely is time to move on. The optimist in me can turn negative to positive by simply knowing that we ALL have delightful tangles of personality flaws. So, let's hang in there together and know that we can somehow work it out. I will save my own "Drama Queen" flaw for another time and something else much more important.